Margaret Koli is an associate within the EduSphere section at UNU-EHS for the Pan African University Institute of Water and Energy Sciences (including Climate Change) (PAUWES) project. She joined UNU after leading partnerships at Human Needs Project, an organization dedicated to providing innovative energy, water and sanitation solutions to people living in informal urban settlements. She has also worked for Doctors Without Borders (MSF-Spain), the UN World Humanitarian Summit, the African Union and UN Environment. Her academic research on livelihoods and environmental governance in extraction industries led her to work on a research commissioned by International Alert on Governance and Livelihoods in Uganda’s Oil-Rich Albertine Graben. She further delved into this research track at the University of Oslo where she had the opportunity to examine governance structures and environmental accountability in extraction industries. Margaret has been a spokesperson at high-level international conferences for the initiatives with which she collaborates. She has won awards such as the Aspen Institute Ideas, Luo Hong Foundation and Bayer Young Environmental Envoy. 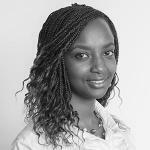 She is currently a member of the UN Habitat Youth Advisory Board and Médecins Sans Frontières – East Africa Association.